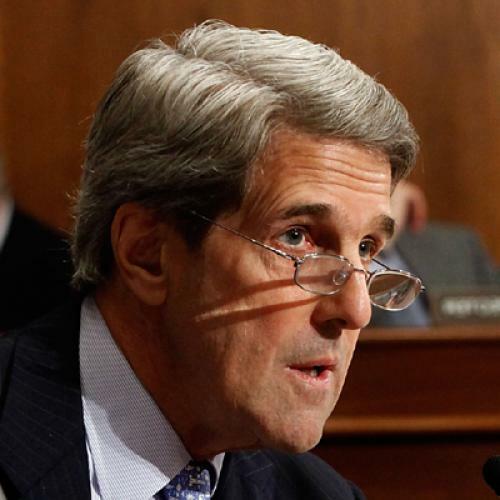 What Barack Obama could learn from John Kerry. Washington—One of the strangest lead sentences I have ever encountered appeared in Politico last week. It read: "John Kerry has been the most aggressive advocate of climate change legislation in the Senate this year—so aggressive that it's rubbed some of his colleagues the wrong way." The story went on to say that Kerry's "zeal" is "making some swing-vote Democrats cringe at the thought of negotiating with someone they fear is tone-deaf to the political realities of their respective states—particularly in a difficult midterm elections year." So there you have it: Once criticized for being too aloof and patrician, Kerry is now being assailed for daring to have passion for the cause of reducing the amount of carbon we are pumping into the atmosphere. Note that none of this is about the legislative merits. Kerry is being criticized for caring too much about an issue and not thinking enough about an election—for being insufficiently opportunistic and unprincipled. And Democrats wonder why the polls find an "enthusiasm gap" that suggests their supporters will sit around grumpily in November while Republicans flood the polling places. It might help if voters saw President Obama and his party in Congress fighting for something going into these elections (including their record on health care and financial reform) rather than reacting, retrenching and retreating. Kerry's attitude is not the problem. It's part of the solution. Let's be clear: Yes, it is hard for politicians from coal states, or from states whose utilities use a lot of coal, to get enthusiastic about carbon caps. It's also true that many of the Democrats fighting for their political lives represent rather conservative states and districts. They hear most from voters who are talking—make that yelling—about big spending, big deficits, big government. Some of their constituents even think of Obama as the Manchurian candidate. There's also this: If the unemployment rate were hovering around 5 percent instead of above 9 percent, and if Republicans were not intent on using the Senate to stop just about everything Democrats are trying to do, the public's mood about Washington and how it works would be less lethal. In the face of these core problems, there is increasing grumbling among congressional Democrats about the Obama administration's habits. Some wonder if Obama is indifferent to their fate. Others sense that the president is far more solicitous to those who oppose him than to those who bleed for him. And many are questioning whether Obama's lieutenants have figured out that they have not been the messaging geniuses in the White House that they seemed to be in the 2008 campaign. On the current course, even a Republican Party whose leaders say the most outlandish and extreme things—and whose own congressional rank and file worry about their lack of a coherent program—could take back the House and make deep inroads in the Senate. Which brings us back to Kerry, who in an interview made no apologies for his eagerness to get an energy bill. What's striking is that he has negotiated with every industry and trade group imaginable to find a deal. If he's passionate about this, he's also been relentlessly practical. And he notes that many businesses groups would prefer Congress to deal with the carbon question. "They see it coming from the EPA and regulation, and they would rather have us legislate," he said. Kerry's persistence is one reason why the Senate leadership and a White House with which he's been working closely are still trying to push an energy bill through. Someone needs to find the same pugnacious spirit on a jobs bill. Yes, crucial assistance to states that are slashing programs and raising taxes has been blocked by Republican senators—including Olympia Snowe and Susan Collins of Maine. Both prize their moderate images, but neither has been willing to break with the GOP leadership. But either Obama and the Democrats really believe that giving the economy another shot in the arm now is essential, or they don't. If they put no punch behind their argument, voters will have no idea that some state cutbacks or tax hikes they are worried about could be avoided if Congress were willing to act. The Obama of 2008 understood how to define the stakes and how to rouse the faithful with both reason and passion. What happened to that guy?